This is called Crimson Sunbird in the Kennedy guide. This was our target bird for our first birding trip to Dumaguete. The face looks similar to the Temminck's Sunbird we saw in Kota Kinabalu. It has a vivid red color. The red is so deep it seems to be pouring out of the feathers. This bird was well named. The blue feathers become iridescent when the light hits it at a certain angle. We had good looks of this bird. It would always go back to certain favorite spots. We saw it in two locations. The photos were taken in Forest Camp, Valencia. 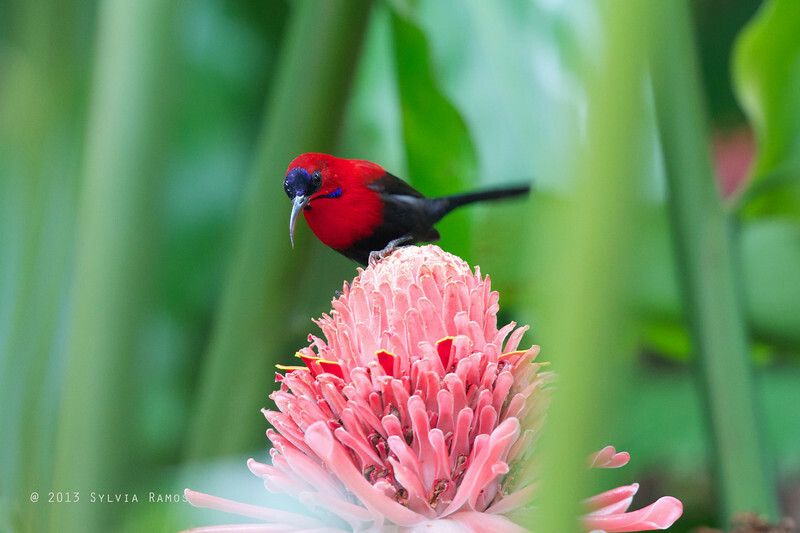 In 2013 we went back to Negros and photographed this bird in Josef Sagemüller's place. There is a proposal by Hosner, Nyári & Moyle to treat this as a separate species Aethopyga (siparaja) magnifica Magnificent Sunbird. This would make it a Philippine endemic.